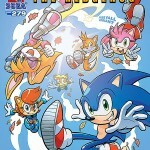 So, after over two months since we last saw a monthly series release, they’re back in business, and Comic Book Resources has the preview for Sonic the Hedgehog #279! 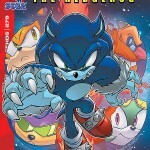 Sonic, now in Werehog form, Antoine and Big had teamed up with the new Shamar Freedom Fighters to take on Egg Boss Nephthys the Vulture, but she’s managed to get an ambush on them! Can they retrieve the Gaia Key Guardian and survive Nephthys’ onslaught? And is there more to the situation in Shamar than the Freedom Fighters realise? Find out in “Face of the Enemy”: part 2. 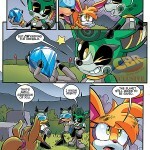 Meanwhile, Bunnie and Cassia are still at loggerheads over the Chaos Emerald that’s in their possession, but they may not be the ones with the most to lose as there’s still twisted secrets to be found by either Sally or Clove even in victory! 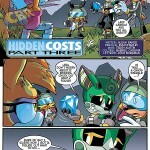 This is “Hidden Costs”: part 3. Sonic the Hedgehog #279 is set for release on March 23rd next week, so make sure you pin that in your diary so you remember that you can pick it up at last! I hope my issue comes in the mail soon. I used to just pick these up at my local store, but now that I’m attending a university, maybe I should just get a subscription instead. Why can’t the comics be as good as the games? It’s better if you don’t ask. The answer would just be as nonsensical and as confusing as you think it is. He’s from Bizarro World. What I mean is that the comic is more interesting than the recent games lately. Imagine if we actually got a Sonic and Megaman crossover game? 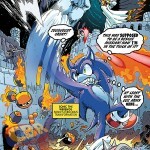 Imagine a game that has Sonic’s adventures known from the comic? A game that takes place in Knothole village. A game that is actually based on the comic. I think that would be an interesting thing to do. Then why did you say the opposite up above? Or, it is Opposite Day, and I’ve been totally caught off guard. * Why can’t the games be as good as the comic? Sorry guys for the mixed up comment. This is what I meant to say. I’d love that too but you did say the complete opposite in your first comment… lol Funny thing is, however, SEGA DID have a concept for a game based on SATAM back during the whole Sonic Xtreme debacle. I wish that had become a reality because it looked good! It was a 2D platformer that focused more on action and stealth than pure speed, requiring far more skill and thought on the players side. I think that would’ve been a real game-changer. Especially since it was during an era where the likes of Metal Gear Solid and Tomb Raider became cult hits. I feel like since the comic is still going on, it’s not too late to create that kind of game. I know how this issue turns out, Midesta Egg Boss Nephthys is actually a close friend to the Shamar Freedom Fighters. Under the threat of the Eggman Empire, she joined the Egg Army to keep the people safe from Dr. Eggman, but still keep control over the region for the doctor. The Shamar Freedom Fighters followed on part, acting as the opposition to the Midesta Egg Army to give the people hope, but secretly trying to keep balance with the Egg Army for Nephthys. 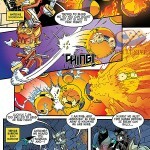 I can’t imagine with Dr. Eggman will do to Nephthy if he found out she was deceiving him. 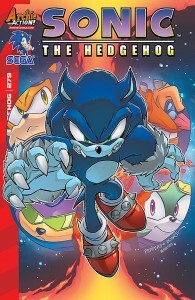 Would be hyped, if I didn’t already read the digital version. More excited for Eggman’s Dozen and The Egg Bosses. Same here. I’m glad to see Archie haven’t somehow died off though. They had me worried for a moment there!